In order to gain rank recognition from ITF HQ Korea the candidate must first become a member and then apply for recognition through the process outlined in our rules and regulations. The two types of candidate that may be considered for rank recognition are those who have already been part of another ITF organisation and those who have no previous background in ITF Taekwon-Do but have substantial experience in other martial arts and wish to develop their future as ITF exponents. Candidates that have previously gained rank from another ITF organisation must complete the appropriate forms and provide documentary evidence that shows they have fulfilled the requirements outlined for the equivalent rank in ITF HQ Korea and after a successful assessment process of their application by the ITF HQ Council of Masters they will be recognised at the rank appropriate to their experience and ability. They will be provided with certification of this approved rank after a period of one year post joining ITF HQ Korea and the rank will be recognised at an appropriate date according to the rules and regulations of ITF HQ Korea. Candidates who have little or no experience in ITF Taekwon-Do will be assigned a mentor on joining and may apply for rank recognition after a minimum period of membership of twelve months. They will on joining ITF HQ be required to formally agree to adopt ITF Taekwon-Do as their discipline and will be required to provide documentary evidence of their experience and background in other martial arts. They will be given recognition of their prior learning and will be assessed by their mentor and the ITF HQ Council of Masters at a time determined by their mentor after the 12 month period and an appropriate rank will be attributed to the candidate after the assessment procedure is completed. Rank recognition is affordable for the entire global community and includes concessions for the economically disadvantaged countries. Thus reflects ITF HQ Korea’s commitment to providing high quality reasonably priced services. Certification is provided using a merit system that removes bias or favoritism. ITF’s recognition program is designed to ensure that all certificate holders have demonstrated their competence through fair and valid measures. 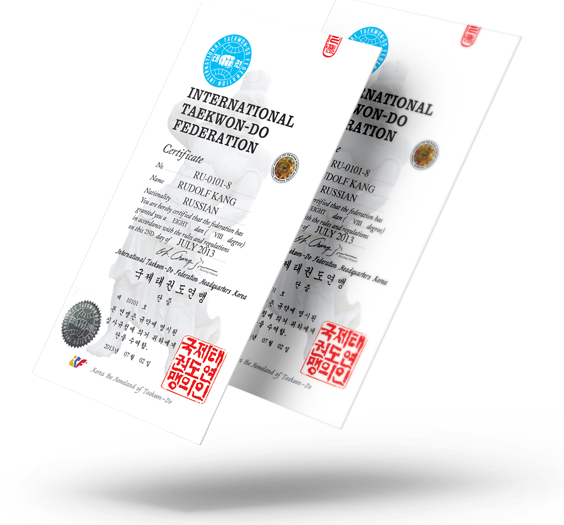 Our certification recognition programs are based on credentials and other reliable qualities that characterize the International Taekwon-Do Federation. By having your rank recognised by the ITF you will enhance your credibility as an instructor.